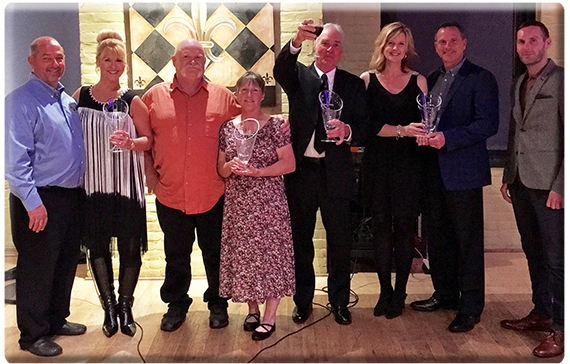 Commissioner's Cup winners honored Nov. 18 in Louisville were, from left: Chad and Lenée Peach, Prodigy Vineyards & Winery; Rex and Diane Reid, Reid's Livery Winery; Jim Wight, Wight-Meyer Vineyard & Winery; and Deb and Tom Parnigoni, Brianza Gardens and Winery, with Tyler Madison, the Kentucky Department of Agriculture's grape and wine marketing specialist. FRANKFORT (November 21, 2017) — Some familiar names and a first-time winner rounded out the list of Commissioner’s Cup-winning wineries at the 2017 Kentucky Commonwealth Commercial Wine Competition. Best Dry Red – Prodigy Vineyards & Winery, Frankfort, Chambourcin, 2013. This was the first wine to repeat as a winner in the five-year history of the competition, although it was a different vintage. Best Blush/Rosé: Wight-Meyer Vineyard & Winery, Shepherdsville, Pink Diamond (Diamond/Concord blend), 2016. The award was Wight-Meyer’s third Commissioner’s Cup since 2014. Best Sweet/Dessert Style/Fruit: Brianza Gardens & Winery, Crittenden, Sweet Bottom White (90% Vidal Blanc, 10% Riesling), 2016. This was the first Commissioner’s Cup for a newer winery that entered the Kentucky Commonwealth competition for the first time. Best Boutique (Small Production) wine: Reid’s Livery Winery, Alvaton, Traminette, 2016. This was Reid’s Livery’s second Commissioner’s Cup, both in the Boutique category. The Commissioner’s Cup winners were honored in an awards dinner Saturday at The Loft @ Over the 9 in Louisville. To be eligible for the Commissioner’s Cup, a wine must be awarded a gold medal in the competition and must be produced from a minimum 75 percent Kentucky fruit. Kentucky wines earned 18 gold medals, with eight going to wines from Purple Toad Winery in Paducah. Wines were judged blind based on individual merit. A total of 162 wines were entered and judged on Oct. 14 at the University of Kentucky Horticulture Research Farm in Lexington. With a goal of public awareness and education through promotion and recognition, the Kentucky Commonwealth Commercial Wine Competition & Commissioner’s Cup is the quintessential yearly guide to the best wines produced throughout the state. Eligible only to licensed Kentucky small-farm wineries, the competition assembles panels of expert judges made up of industry leaders throughout the nation to systematically assess and score entries. For a list of medal-winning wines, go to competition.kentuckywine.com.